Crystalens Trulign Accomodating IOLs - William Goldstein, M.D. Intraocular lens are artificial lenses implanted into the eye to replace damaged natural lenses or to compensate for the cataract removal. Crystalens and Trulign Toric are the two approved intraocular lenses and are implanted by a method of accommodation. They are mainly used to improve vision capabilities of patients who underwent cataract surgeries. Both these lenses are manufactured by Bausch and Lomb. 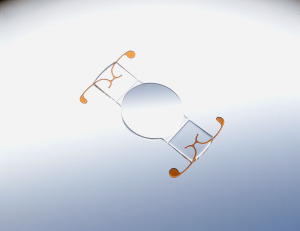 The IOL Trulign is simply a toric variant of Crystalens which can do accommodation and astigmatism correction. The natural lens of the eye are completely replaced in any IOL procedure, but in the method of accommodation as in the case of Crystalens and Trulign Toric, they only shift their position in line with the action of eye movement to enhance eyesight. So, both the accommodation methods are commonly referred as presbyopia correction IOL. The need for these cataract lenses is that people in their middle ages have their focusing getting more rigid and limit their eye sight capabilities. Presbyopia is that condition where the eye’s ability to focus on objects closer to the eye are reduced. Accommodation IOLs such as Crystalens and Truligh toric are able to correct the condition of Presbyopia without the need for reading glasses as in case of the standard monofocal IOL. The Crystalens technology has evolved over the last decade. The approved original version of IOL was that of Crystalens which was the Model AT-45 approved by FDA in the year 2003. With a slightly more optic, the Crystalens Five-O was introduced in the year 2006. Later, in the year 2008 Bausch and Lomb acquired the technology and subsequently introduce the High Definition Crystalens. The HD Crystalens features an advanced design in optics that enables the clear focusing of objects nearby. The technology has recorded better results among maximum number of patients who underwent the treatment. Another feature of Crystalens is the reduced chances of glaring effect and the disturbing halos in low-light. The Crystalens Aspheric Optic came with improved contrast sensitivity and less distorted vision. The Trulign Toric was approved very recently in the spring of 2013. It’s a slight variant of Crystalens IOL and has the ability to correct astigmatism with a posterior optic surface. Cataract Surgeons in our hospital located in Shelby Township in Michigan have thoroughly updated their knowledge and interest in accommodative IOL technologies. They will be able to suggest you the best technology for your needs.